Mobile Photo Album is a Adobe Lightroom web gallery plugin. It is designed for making instant gallery which can view on mobile device such as iPhone and Android phone. By HTML5/CSS3 technology, no Flash plugin is needed. So, you can view the gallery on all mobile device which support HTML. Now photographers can make photo gallery which can view on billion of mobile device. With extremely "easy-to-use" interface, just a few click from the interface to create the gallery instantly. 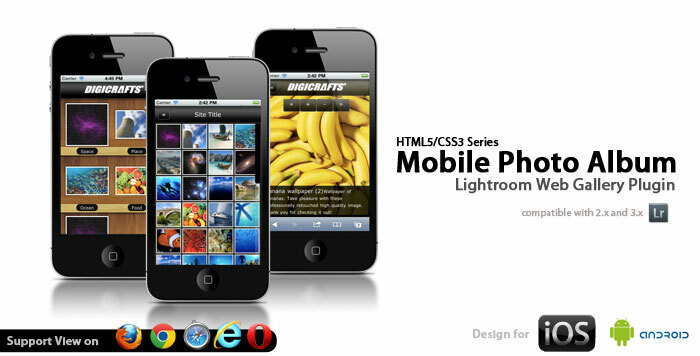 This Gallery is specially design to work with mobile browser in iOS device such as iPhone and iPad and Android devices. Let viewer easily navigate between photos. This gallery support navigation between images by swipe your finger. Also, you can zoom in/out the image by pinch open/close your finger on the image. Beside mobile phone, the gallery support viewing on iPad or other android tablet. Also it can view on most modern desktop browser. Easy to change theme color and background. Included sereval backgorund to choose. Beside full screen gallery. It is included a template for easy integration with your existing website.